^ Marie Frisardi Cleary (1985年5月19日). 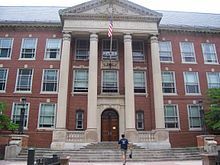 “"The Halls of Boston Latin School"”. New York Times. 2009年11月22日閲覧。 Letter to the editor. ^ Kate Stevenson (2008). National Foreign Language Week Archived 2006年9月3日, at the Wayback Machine. ^ Boston Public Schools 2006 Budget Archived 2008年2月29日, at the Wayback Machine.